Please refer to our stock # T 1761 when inquiring. Hefty 50 grams! 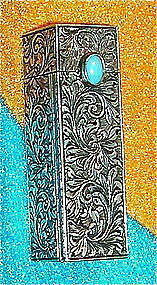 Unsigned, yet having owned several Peruzzi pieces, who else but the Florence Peruzzi Bros could produce this superbly chased ornate early collectible unsigned 800 silver lipstick case. Nice heft at 50 grams or 1.7 oz on postal scale, 2 1/4" x 3/4" and showing an 8mm bezel set turquoise color cab. Early marks: "coffin", 800 & 10. mild mirror clouding, yet the mirror is intact; see #5. Fab vintage condition. $9 USPS Priority/Ins/Track or Free with USA Ck or USPS MO.